Crepes are so easy to make and have always been a favorite! They’re the best treat because they contain the simplest ingredients that you probably always have on hand. In a blender combine eggs, milk, flour, salt, oil and vanilla. Blend until smooth. Heat a skillet over medium-high heat and brush with oil or butter. Pour 1/4 cup of batter into pan, tilting in a circular motion to completely coat the surface of the pan. Cook 2 to 5 minutes, turning the crepe once, until golden. 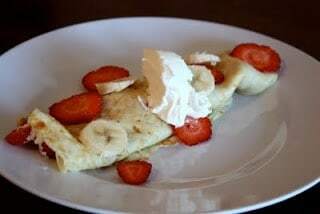 Fill crepe with bananas, strawberries, and whip cream (or any other toppings of your choice) and fold into a crepe. Berries are full of vitamin C, potassium, and fiber. They also contain antioxidants that help fight off disease. Bananas are one of the healthiest foods on the planet. They are full of potassium, fiber, and vitamin B6. Bananas can help your body regulate stress and anxiety levels. Pay attention to how you feel after eating one!